Active Audio Record Component is a simple tool that adds audio recording functions to any program. If you want to register its sound with full control on its codification parameters, don't miss out on the opportunity to download Active Audio Record. Record sound in MP3, WAV, WMA, OGG, AU, AIFF, MP4, FLAC and VOX format. 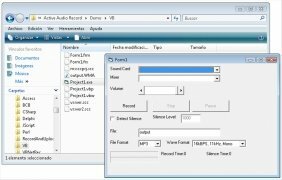 Control the quality of the audio recorded by means of the codification parameters. Compatible with standard sound cards. Includes a function to detect silences. Ideal for programmers that want to include sound recording in their developments. Record stereo audio on two independent mono tracks. Add recording functions to your programs right now! 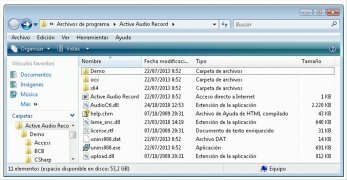 Get hold of Active Audio Record Component and record the sound of programs using all sorts of sources and insert the recording function into your own creations.